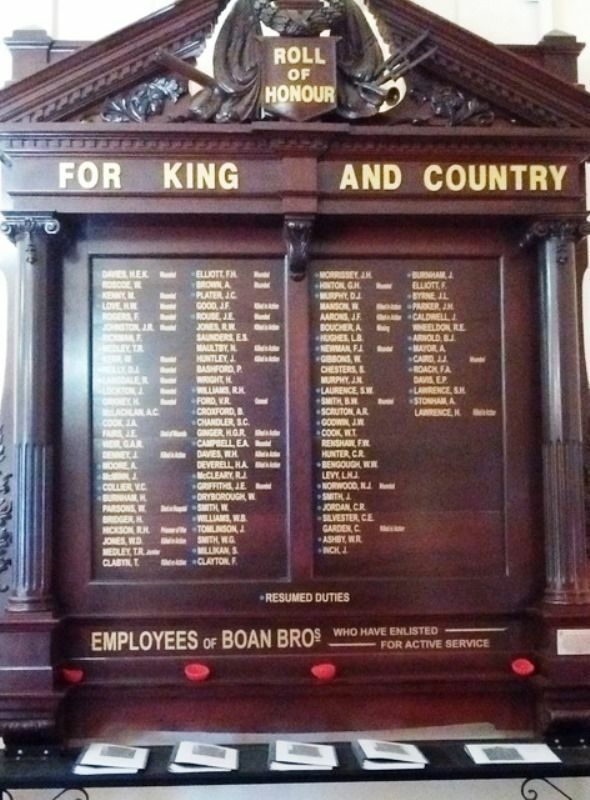 The ornate wooden honour board with intricate carved designs on the top and sides contain the names of employees of Boan Brothers who enlisted in World War One. In 2004, the Cannington Districts Historical Society, who had been storing the Board for sometime, successfully applied to the State Government for a renovation grant. This work was carried out by Talbot Walsh & Co. of Welshpool and was completed in May 2005. Extract from Western Mail (Perth), Friday 3rd November 1916. The Honor Board recently erected by Messrs. Boan Bros.,containing the names of some 100 of the firm's employees who have enlisted for active service, is an extremely artistic and beautifully designed piece of work. It is designed to accomodate some 150 names on two highly polished tablets of Jarrah. These are surrounded by a very massive frame, at the base of which are erected two handsomely carved trusses supporting two heavy fluted columns carrying each a richly carved Ionic cape. Above this is constructed a very massive moulded canopy and frieze on which are the words in large block gilded letters "For King and Country'"Added to this canopy is a pediment of a very massive nature , embellished by some very fine emblematical carving, consisting of the Union Jack and Australian flags. A pyramid, encircled with a wreath of laurel and other martial emblems, in front of which is a carved shield bearing the words in block gilded letters "Roll of Honor". Below the tablet are the words "Employees of Boan Bros. who have volunteered for active service"in gold letters. The whole is a very creditable piece of workmanship executed by Mr. G Stirzaker of the West Perth Cabinet Works. The writing is by Meston and Walters. The Board in all weighs over one ton , and has been hung in a prominent position on the ground floor.